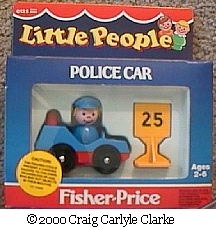 Description: This is an Original Little People Police Car set. The set includes a small police car and a female police officer. In 1985 onward, this set was also sold with a street sign. FLPP - Policewoman with a short blue body and blonde hair in a bob with bangs under a blue cap. FPT223 - Small yellow plastic sign with a square top that has a black imprint marked "25 MPH" and WITH a square black border outline around the edges. The sign has a short post and a square base. FPT714 - Small yellow plastic sign with a square top that has a black imprint marked "25 MPH" and WITHOUT a square black border outline around the edges. The sign has a short post and a square base. FPT446 - Small single-seat Police car with a blue top, red base, a round red siren on top of the back "trunk" area, and marked "POLICE" in white on top of the front hood. The car rolls on 4 black wheels held on via metal rivets. The wheels are NOT marked "Fisher-Price Toys". The back of the car has a small blue rectangular "licence plate". FPT440 - Small single-seat Police car with a blue top, red base, a round red siren on top of the back "trunk" area, and marked "POLICE" in white on top of the front hood. The car rolls on 4 black wheels held on via metal rivets. The wheels are NOT marked "Fisher-Price Toys". The back of the car DOES NOT have a small blue rectangular "licence plate". FP125SET1978 - (Complete set in blister pack) - This set was first introduced in 1978, but was marked #123. It didn't receive it's individual part number until 1979. A mint on card Police Car set marked #123 is very rare and more valuable than a mint set marked #125. FP125SET1979 - (Complete set in blister pack) - This set was sold in a 5-1/2" high x 6" wide blister pack, and was also available in #123 Play Family Vehicle Assortment. FP125BOX1985 - (BOX ONLY) - 7-1/8" long x 2-9/16" deep display box marked "0125". FP125SET1985 - (Complete set in unopened box) - This set was sold in a 7-1/8" long x 2-9/16" deep display box marked "0125", and was also available in #2350 Little People Vehicle Assortment.